10 miles is a great distance to race. It’s right on the edge of what you’re physically able to maintain without getting washed out with lactic acid. There is no let up the whole way around, pushing mind and body as far as you can go for in excess of an hour. I had been looking forward to having another crack at the 10 mile distance after missing out on the sub 65 in Dungarvan and the Hope & Dream race suited fine location wise and was for a great cause. A lack of endurance let me down in Dungarvan where I had really only being concentrating on speedwork and shorter easy stuff coming up to it. Coming during early part of marathion training, this race saw me now having done loads of endurance running but zero speed work, but I felt I had improved enough. Micheal O’Muircheartaigh set us off and things started not too pacey. A nice climb up John St and by the time we swung left at Weafer St there was very little changing around me in terms of finishing position. The lads from Slaney Cycling Club had a crew out cycling around offering water if needed – as well as 3 or 4 well stocked water stops. This was a really tough course with plenty of climbing – need to get better at the climbing. 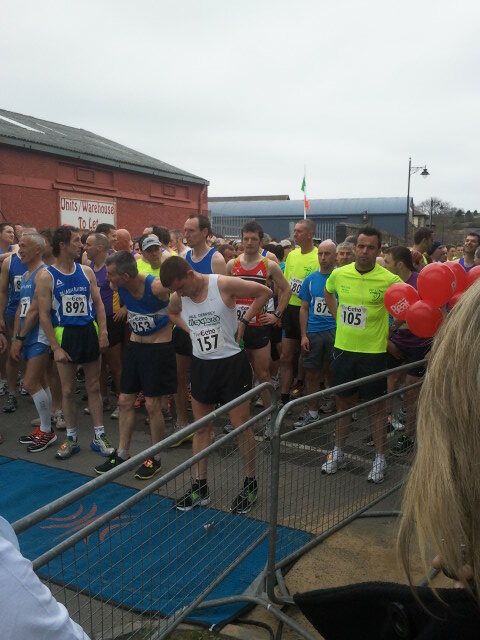 I ran most of the race at the front of a small bunch the rest of which I think were all Slaney Olympic runners. Mick Morrissey is in the O50 category but he is one tough fecker on the road. Every now and again he’d pull up beside me or go by before I’d pass him out again, the rest of the SO lads tucked in behind us. Catherine Murphy is another great runner and was in our group too, you could tell she was holding back till we got to the flyover going into Davidstown and then she just pulled away putting the foot to the floor, no one stayed with her. Going through Davidstown I started to slow slightly only for Mick to come through again and get going once more. Previous races I have let people go by me and not hold onto them, I was really delighted with how I managed to hold onto lads the whole way round this time and not let the head drop too bad too soon. I was really feeling the effect of the head cold at this stage and going up a little hill out of Davidstown Mick passed me again and going by him on the subsequent flat I knew I was breathing too hard and still about 4 miles to go. The whole race was ding-dong the whole way around between the pair of us until we hit the final hill just past the crossroads. The Slaney Olympic lads had been climbing better than me all day and I was in ribbons at this stage after about 8 miles of running on the edge. Mick and another runner went away from me up the hill and despite having some really strong words with myself the legs just wanted to give up and sit down. Managed to keep going and hit the flat before anyone else passed me , but by this stage they had closed in a good bit. Legs were shot and it took a huge effort to keep them moving on the flat. Another SO guy went by me at this stage and there was nothing I could do to respond. I had tried taking a gel a mile or two earlier but when i started to eat it I couldn’t get enough air in through my nose so had to leave it. Reached the final water station now and ashamed to say that I slowed to a walk to get a drink, again hadn’t been able to drink anything of note earlier such was the effort. Managed to get going rightly on the next downhill and had another battle with a third SO runner before he got me on a sneaky small uphill – a nothing of a hill normally. A 4th lad closed in and pulled up beside me on the main road back into town after we had come back out by the old Mill. Thankfully I found something and told myself that whatever it took he wasn’t going past me. Sure enough, I slowly managed to pull away from him again and put a bit of a dent into the gap to the guy in front but never in serious danger of catching him. At this stage eveyone had spread well out and we were all coming into the town individually. Hit the roundabout still pushing hard, took a look over my shoulder for the first time in the race as I was turging right onto the promenade, yer man was well back no danger to me, the guy in front too far to catch, just keep her ticking over to the finish line. Another look 100m later told same story. The chip timing guys had a mat about 100m from the finish so as the lads on the mics knew who was coming. ‘Well John Dempsey you’d want to hurry up if you don’t want that guy to pass you! !’ says Micheal O’Muircheartaigh. What??!! Accelerate as fast as I could and finish 1 second in front of the guy I had only just 200m earlier written off – lessons to be learned all round. Very well organised event, excellent charities, 100% of all proceeds going to the charities. Very hilly course – not one for a PB but is brilliant for a pure race.